07:00 to 11.00 hrs and 15:00 to 17:00 hrs and closed on Tuesdays. Established in 1979, Van Vihar National Park is located in Bhopal District, Madhya Pradesh. Covering an area of 445.21 hectares, the park draws a large number of tourists and about 2.50 lakhs tourists visit Van Vihar every year.Van Vihar Park areas was under the control of revenue department and few owners from Prempura, Dharampuri and Amkheda villages. Considering the importance of Van Vihar National Park was declared as National Park on 18th January 1983. Although, having status of a National Park, the Van Vihar is developed and managed as a modern Zoological Park, following the guidelines of the Central Zoo Authority (CZA). Now Van Vihar is a hybrid between a National Park and zoo. Here, the orphaned animals brought from other parts of the country or exchanged from other zoos. The park serves as the most important gateway to Bhopal. 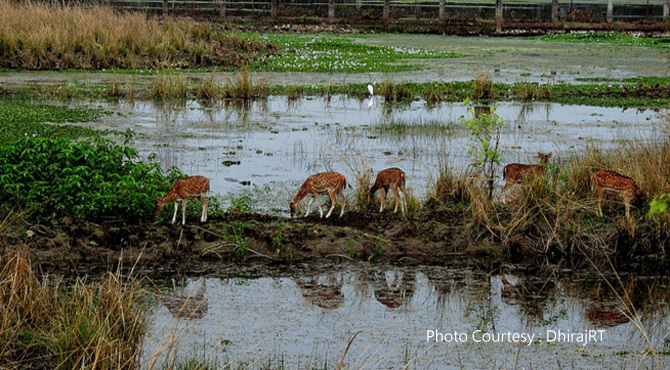 Also known as Safari Park, Van Vihar lies on a hill near the Upper Lake, with an area of about 4 sq km . The main attractions in Van Vihar are Albino Sloth bear and the White tiger. Besides these, the fauna found in Van Vihar National Park are Lion, Sambhar, Cheetal, Nilgai, Black buck, Chousingha, Common Langur, Rhesus macaque, Wild-boar, Porcupine, Hare, Blue Bull, Monkey, Mongoose, Wild dogs, Jackal, Fox, Wolf etc. The park also supports a variety of Ghariyal, Crocodiles, Mugger, Turtle, Star tortoise and Python. According to the lUCN's Red list, the gharial is the most threatened of all crocodilian species. Van Vihar National Park also boasts of a large variety of avifauna. About two hundred species of birds have been listed in different parts of Van Vihar which includes migratory birds. Around 60 wide variety of colorful butterflies and insects can be seen at this park. The forests here are tropical moist deciduous type. They are interspersed with swamps. The park consists of moist Sal bearing forests, dry Sal bearing forests, moist mixed deciduous forests without Sal, cane. The Bel, Amaltas, Babul, Reunjha, Doodhi, Lendia, Saja, Amla, Tendu etc are the common trees in and around the park. Besides Aak, Karonda, Besharam and a variety of other Shrubs and Herbs are also founds in Van Vihar.